We have been following the policy of Good Quality, Timely Delivery, Reasonable Price and Complete Service in providing services for our customers and have gained praises from our regular buyers with good reputation. 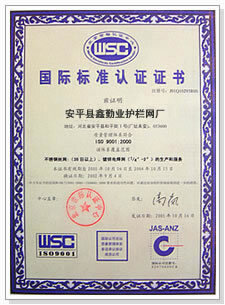 We enjoy advanced equipment and technology, scientific management, and have adopted complete ISO9002 quality control system. 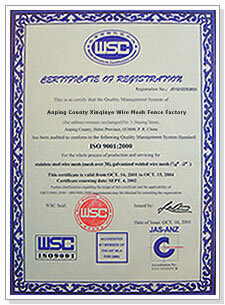 All the products are produced under careful and standardized quality control processing. Our main products cover pool fencing, sports fencing, chain link fencing, euro fence, welded wire mesh fence, temporary fence, iron decorative fence, barbed wire fence, razor wire fence and palisade fencing products. Besides supplying domestic market of China, we also export in large quantity to America, Germany, France, Italy and Southeast Asia. We enjoy advanced production equipment for manufacturing. We have over two hundred production equipment including 46 wire drawing and annealing equipment, 14 galvanized wire production line, 43 sets of nail making machine and 12 sets (pieces) mesh processing equipment to produce quality metal wire fences for our customers. For more information about our services, feel free to contact us.